Excuse me while a rant a bit about the open floor plan that is so popular in new construction and remodeling projects today. While they are super trendy and seemingly helpful for family living, open plans come with a myriad of obstacles that consumers don’t anticipate when they are looking at homes. People shop for homes like they shop for cars, clothes and lamps–in a vacuum. What I mean by this is that they don’t consider how closely bound their lifestyle and a house floorplan are. They start looking at what everyone else’s homes look like on popular sites, such as Zillow and Pinterest, on-line and look for that home. 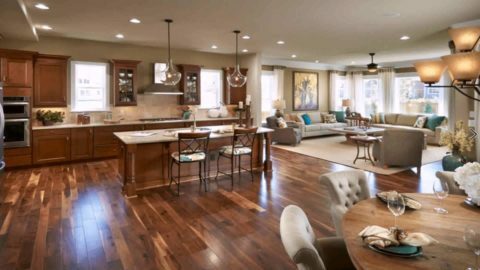 Questions house shoppers and home renovators ask themselves are: Is the kitchen open to the family room? Or, can my rooms open to each other so we can entertain large parties? How you live in a home, how it functions, is just as important as how it looks. And, in my experience, most people focus on how a home looks versus how it will function. Let me show you how important it is to consider your lifestyle, how you are going to live in the home, versus how great a home looks when considering renovating your home to open plan living. 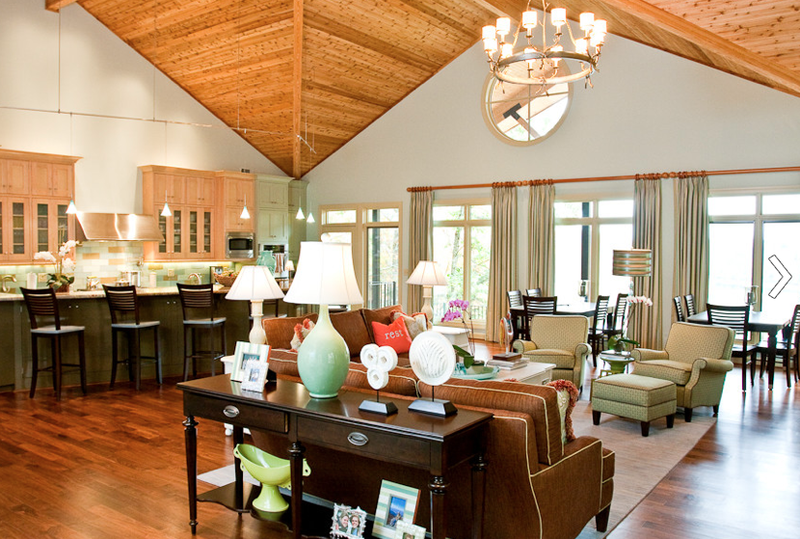 A lakehouse project I designed many years ago is the time when open concepts are perfect. However, this concept is not so conducive for daily living. Young families can be the biggest victims of open plan living because it seems like it would be a great idea to have all the rooms open to each other. After all, you can see all the kids while you are cooking dinner, you can eat close to the kitchen and be close for spill clean-up. Kids, especially toddlers, love to be close to their parents while playing, so having all the rooms open and close by must be convenient, right? Well it is convenient, but proximity can create other problems. 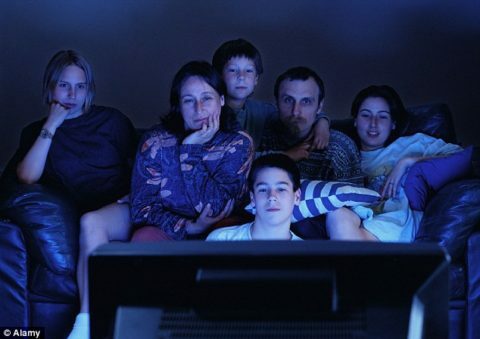 There is nothing more irritating that the slow building of noise between children, television and houshold noises. Noise is a big negative to open plan living. Consider standing at the kitchen island as you prepare dinner. 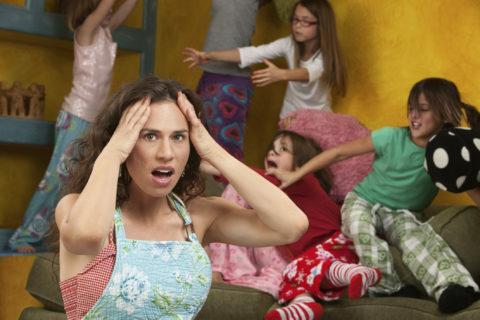 Pots and pans clinking and clanging together as your kids are watching television. The noise of cooking mean the kids can’t hear a thing, so they keep turning up the volume on the television. The kitchen noise is making the TV noise go up even louder. If the rooms were close together, but had an opening, maybe with pocket French doors you could close, it would help tamp down the noise. Also, consider nap time. The great room has two-story ceilings and whether the television is on or there is cooking noise, the open floor plans act as an echo chamber, possibly waking up the napper. Another problem with open plan living is it becomes difficult to hide messes from guests. This is even more difficult in kitchens, where you are perhaps having a dinner party and the pots and pans are left in a heap visible from the dining area. Again, if the kitchen had cased openings where you could see through, but perhaps close off a sliding door, it would give you the option of hiding the messy kitchen from guests. While it may seem romantic to envision a home where your family is together all the time, the practicality of kids having homework and practice, adults have work and social lives–and then there’s the television–things can get complicated quickly. While being together is a great thing for families, sometimes Sister wants to watch TV while Brother has to do his Algebra homework. This creates a major issue. Who gets to do what? Do you send one to his room for homework, or does the other sibling have to watch Netflix in her room alone? Neither are good options. Creating separate spaces that can be open when you want them to be and closed when they need to be for multiple uses will give you more options for your family. 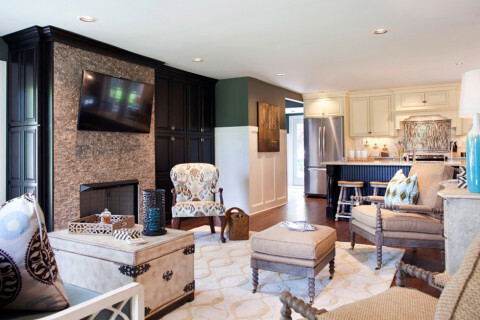 In this open concept project, I resolved a few decorating dilemmas by using the dark cabinetry at the fireplace to change colors from the kitchen to the living room. Open plan living can create a difficulty in decorating due to the size of the rooms that come with open floor plans. With the absence of cased openings, the rooms are now just one large room, so changing wall colors or wallcoverings to create a more dynamic interior becomes more challenging. Can you overcome these challenges? Of course you can, but it does take more skill than the average homeowner has to decorate these rooms in order to feel dynamic, intimate and visually interesting. Without walls all the furniture has to be floated in the room. 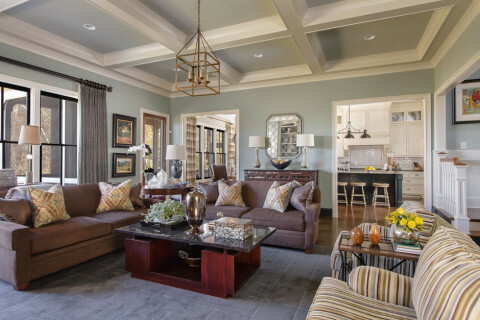 In my experience, laying out a useful and plentiful furniture arrangement in the open plan room is a challenge for most homeowners because they do not have a wall to put the sofa on. Or, they feel they need more space for traffic flow, so they limit seating in order that the room is easy to maneuver. 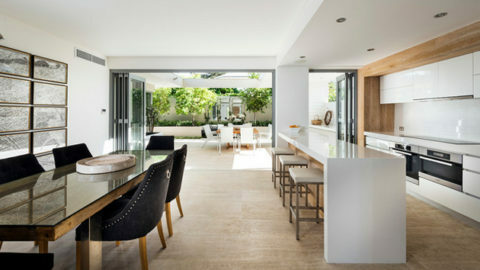 For example, in this project we designed two large cased openings allow for the kitchen and the den to be separate. But there is still good traffic flow as well as a separate area for cooking and dirty dishes and a complete other space for TV viewing and visiting with friends. I am not saying open plan living is bad. What I am suggesting is looking for ways to open up traffic flow and sight lines in your traditional layout in order to give you flexibility for living successfully in your remodeled home. If you can open up visual sight lines between rooms, perhaps with pocket doors that can be closed when you want privacy or sound control is a way to start. For your open concept kitchen, you should consider flanking the island with doors (making it more of a peninsula) so that you can shut the doors for a dinner party or if Junior’s daily cartoon watching makes it difficult to concentrate on a new recipe. There is a happy medium between completely open rooms and separate rooms. The trick is to find the perfect balance.